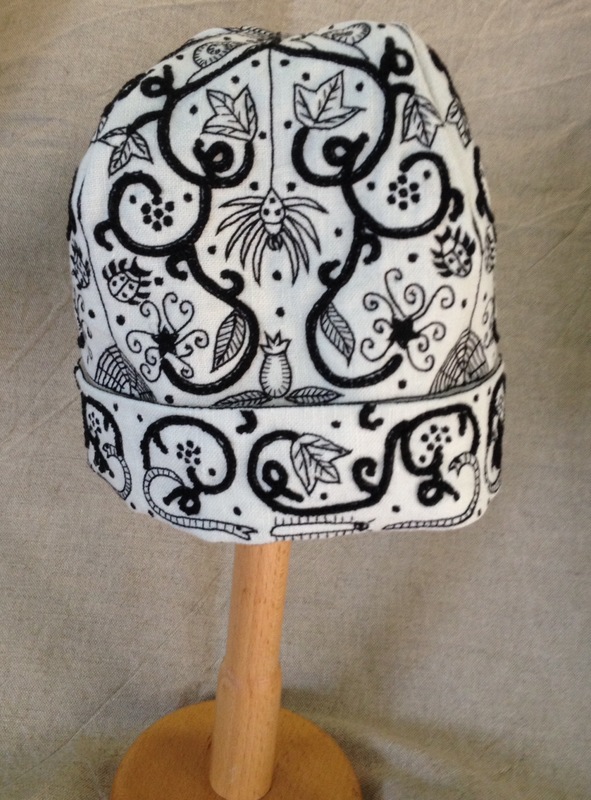 Linen caps were worn in the 1640s, some of them were decorated with embroidery. 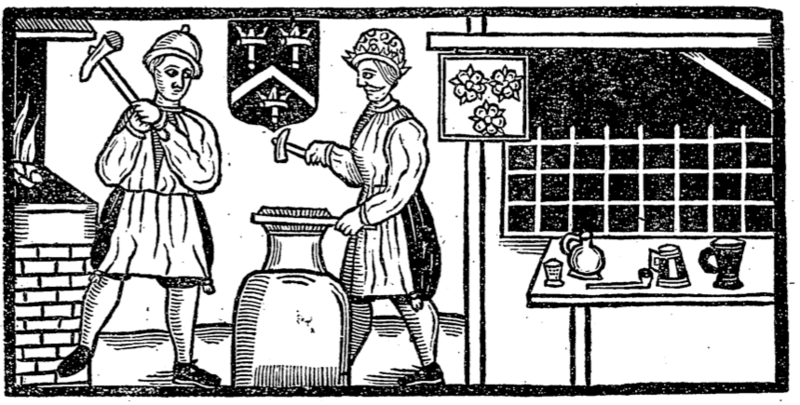 I’ve seen examples in museums and the picture above from ‘A Merry New Ballad, Both Pleasant and Sweet’ from 1635 shows a blacksmith sporting what seems to be a blackworked cap. 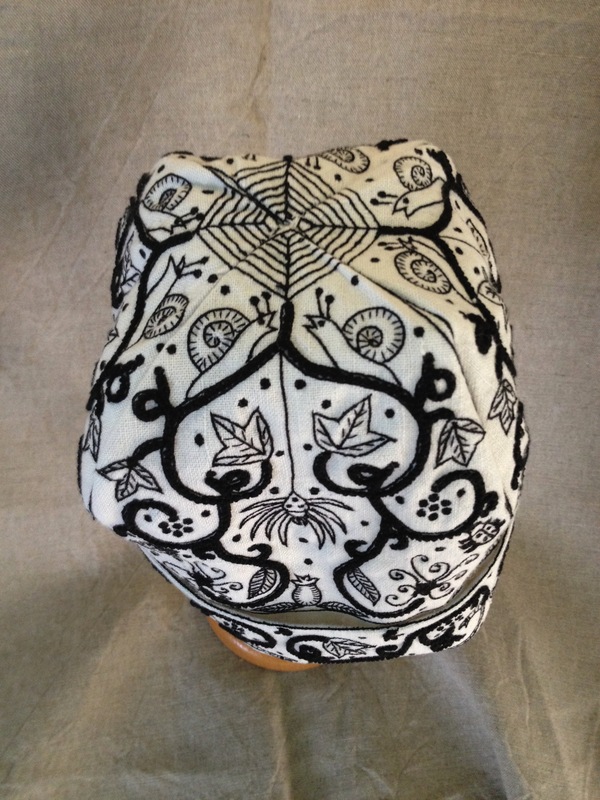 The basic pattern of the caps remaining from the 17th century is four sections, sewn together with a turned up border. I tried the pattern, made up one and decorated it with some basic cross-stitched decoration. It was nice, but not really what I wanted to represent, just a bit too plain for my taste. I wanted something a bit more like the caps I’d seen in the V&A. 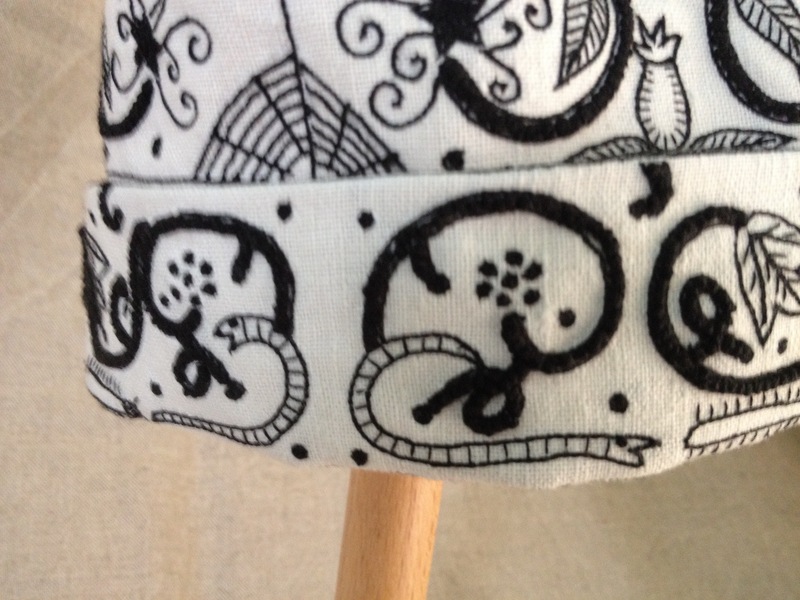 What we did then was to draw up a design based on embroidery we had seen in museums and pattern books that didn’t quite recreate, more echoed the swirls of chain stitch and odd critters that seemed to have been popular at the time and superimposed it on the basic four panel design. The panes were filled with design, but that is also authentic, some of the original caps seem to overflow with all kinds of shapes and ideas. The theme chosen was autumn and several types of small creature were included, as well as seed heads of clematis, rose hips and ivy leaves, intertwined with cobwebs and a spider dangling through the centre. 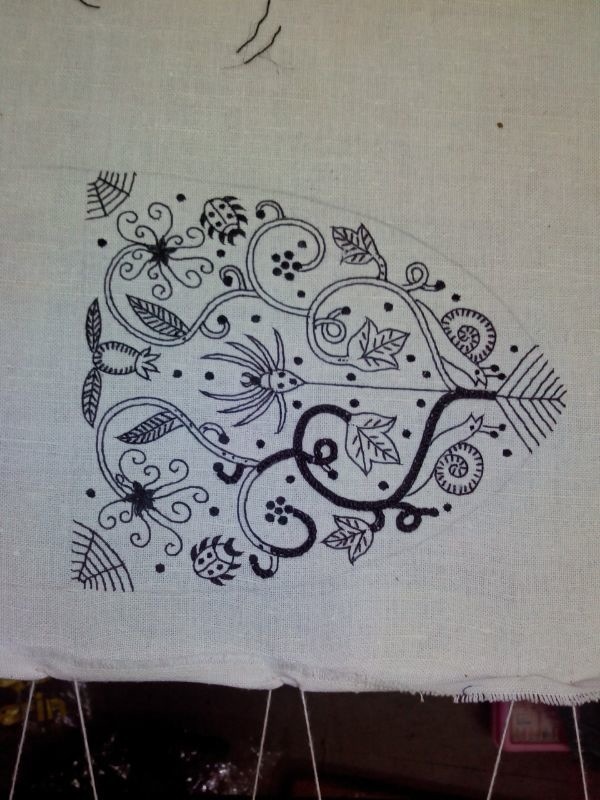 This was sent to Aaraish Designs in Mumbai with a square of linen cloth and a reel of silk embroidery thread. The guys in the workshop work in teams and embroider by hand, several workers to a single piece. The next pictures show what they came up with, the first one showing the work stretched out on the frame. 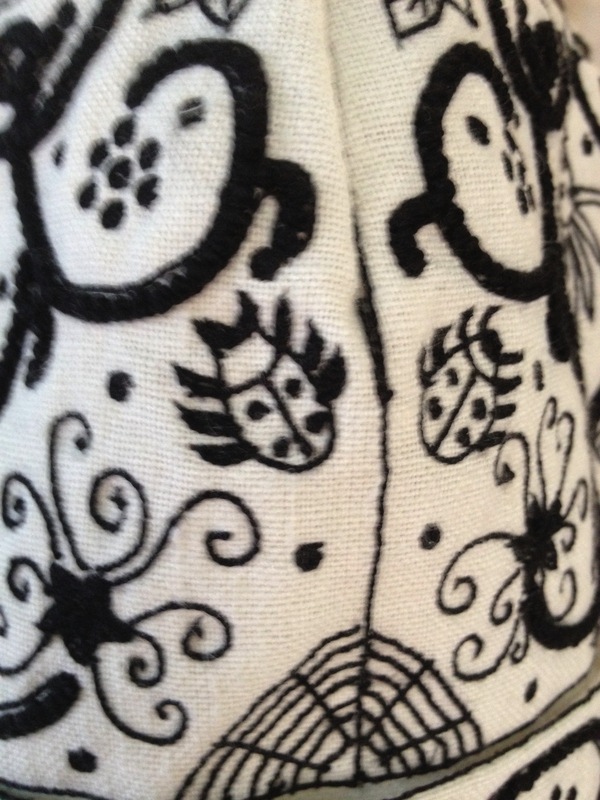 Note the border is worked upside down and on the reverse of the fabric. 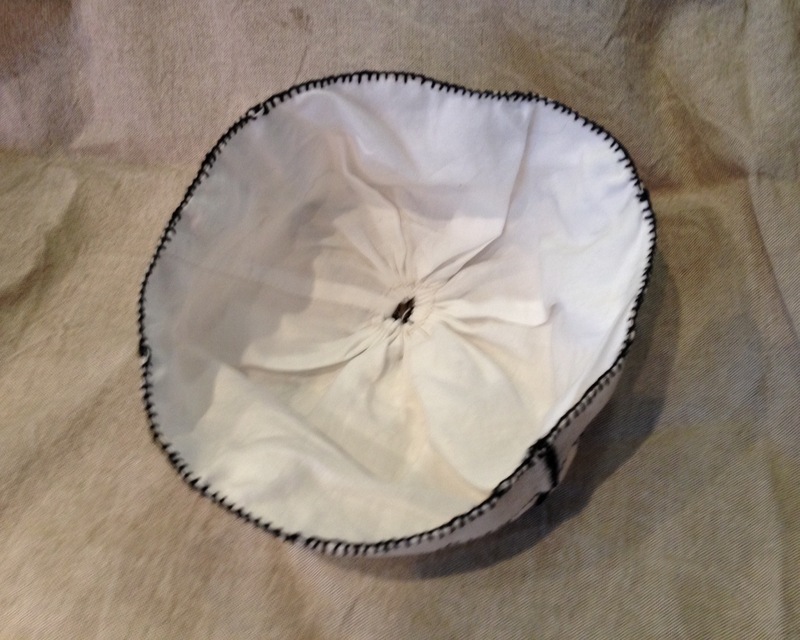 All that needed to be done was to cut out the work, sew up the edges and pop in a liner. 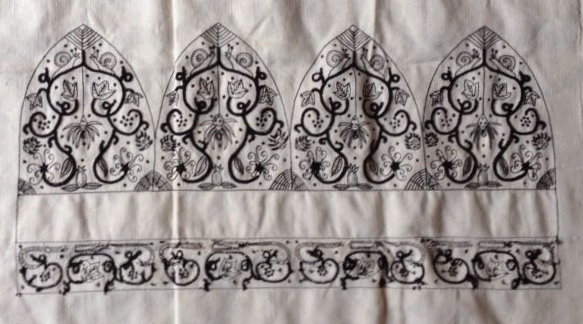 The lining is based on a couple of examples I’ve seen, one in the Museum of London and the other in the V&A. 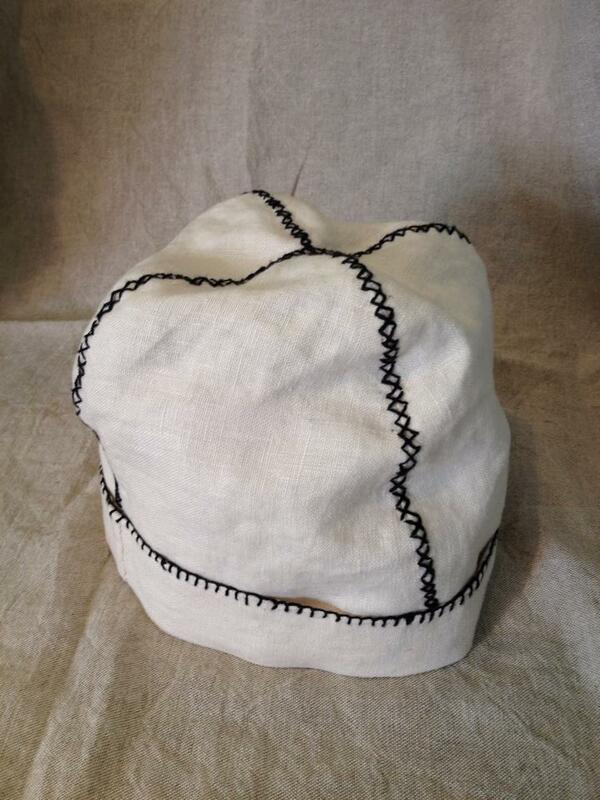 It’s basically a cylinder gathered at the top and secured with buttonhole stitches. This is more the kind of cap I was thinking of! Well done to Aaraish designs and to Tracy who drew up the original pattern. Needless to say, if you would like one for yourself, get in touch and we can discuss some designs. whats the filler stitch they’ve used on the stems- it doesn’t look like plaited braid?